SRH won the toss and chose to field. 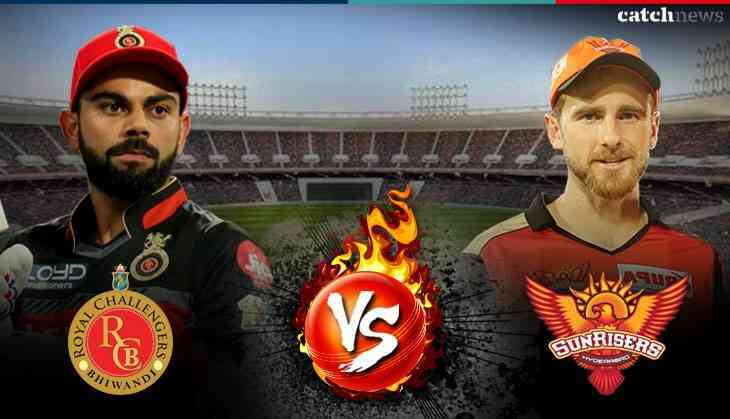 The table toppers, Sunrisers Hyderabad are going to clash with the Royal Challengers Banglore in the match 51 today. While SRH have already paved their way to the playoffs, RCB are a defeat away from getting eliminated from the tournament. RCB need to win while SRH are in a habit of winning. RCB have had a mixed season this year where they lost a number of matches consecutively one after the other but have now been able to balance themselves up to an extent. RCB are hanging on a fragile thread and a little mistake at this stage of the game would mean nothing but elimination. RCB's performance has been hot and cold this season but they are getting their form back right on the spot. Having won both of their last matches, Kohli's army must be brimming with confidence. Their performance has seen a complete turn around in the recent matches. The match against KXIP was by far their best; the bowler's bowled to a plan, the fielders supported their cause in the field, and the openers then knocked off the runs required. Virat Kohli and AB de Villiers are the biggest match-winners among the RCB batsmen while the Hyderabad happen have the bowlers who would like to stop the hitters of the RCB. Umesh Yadav and Yuzvendra Chahal have become the two dependable bowlers. For Sunrisers, each of the bowler's has made significant contributions to the team's success. However, Bhuvneshwar Kumar, Sandeep Sharma, and Rashid Khan will have to do the bulk of the damage with the ball.